This weekend is the first weekend we didn't go to the trailer. My wife is visiting her Dad out of town, and I am all by my lonesome in the condo. I'm bored. But I also have a cold so I am taking Niquil and watching TV all day. We spent this weekend with my father and brother and his wife. It was great to share with them our new passion. We has a great time. Too bad we could only stay a couple of days. I rented a room for my brother and his wife at the hotel and my Dad stayed with us in the Airstream. 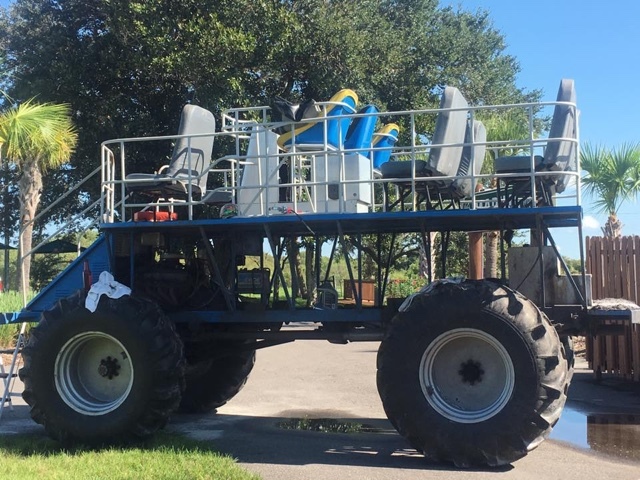 We went for a swamp buggy ride today and it was a blast. River Ranch has a lot of outdoor activities, but it's soooooo hot! This will be a lot nicer in December. So both ACs dripped today. It was the weirdest thing. They dripped right after I turned them on. Only for a minute. And when I turned the off. A few drops. During operation they drain fine. So this is not a drain issue. What else could it be? Ran both ACs for 12+ hours, and not a single drop of condensate inside the trailer! Yay! There is a ton of water coming down the side of the AS, but that's a much easier problem to deal with (ignore). The AC tech is coming out for the third time on Friday, and the third time's the charm. The front AC is 95% fixed. It can run 9 hours without dripping. The rear AC can run about 5. So I'm thinking either bigger holes or extra holes will drain enough water to finally put this issue to bed. 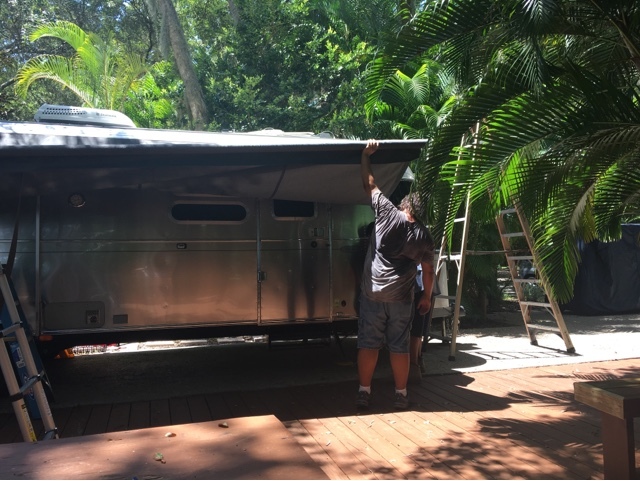 How Do You Weigh Your Airstream? I realized that this is not something most people do often, so I figured I'd share my method. I downloaded two apps to my iPhone. CAT (Certified Automated Truck) Scale and Weigh My Truck (also from CAT Scale). CAT Scale is an app that shows all the locations of CAT Scales. I used it to find my nearest CAT Scale. Weigh My Truck is the app you use once you get to the scale to order and pay for the weigh service. It costs $10.50 to weigh your truck. The Weigh My Truck app let me sign in to PayPal so I could pay the $10.50 fee. I did this before I got to the scale so I wouldn't waste time signing up there. If you do not use PayPal I assume you can pay at the cashier. What you do is you drive to the scale. Watch carefully as there is one entrance and one exit. The entrance will be the one that when you drive up to the scale, the call box will be on you drivers side window. These scales are meant for 18 wheeler trucks, so the call box will be a little too high for a regular truck. No worry, since you won't be using the call box. The app uses your GPS and knows you are at a scale. Run the app, hit the accept button, and you are done. A buzzer will alert the attendant your are waiting to be weighed, and they will activate the scale and print out the results. You need to walk into the cashier to pick up the printed ticket if you want it. They will email you a PDF so you don't need to pick up the hard copy if you don't want to. The ticket will show four weights. The overall gross weight is what everything weighs. Then you will get one weight for your front tow vehicle axle, one for your tow vehicle rear axle, and one for your trailer axle(s). Compare the weights of you tow vehicle axles to the weight ratings of the axles shown in a sticker on the front door jamb of your tow vehicle. As long as you don't exceed them, you're ok. If you exceed them, well, time to go on a diet or buy a new truck with higher ratings. 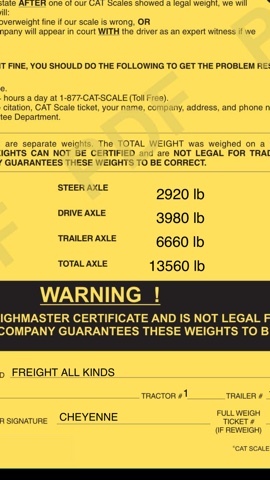 Hope this helps someone else who wants to weigh their truck and trailer. In addition to 303 Protectant and tire covers, I got some plastic garage floor tiles to put under the tires of my AS while I keep it "stored" in my campsite. 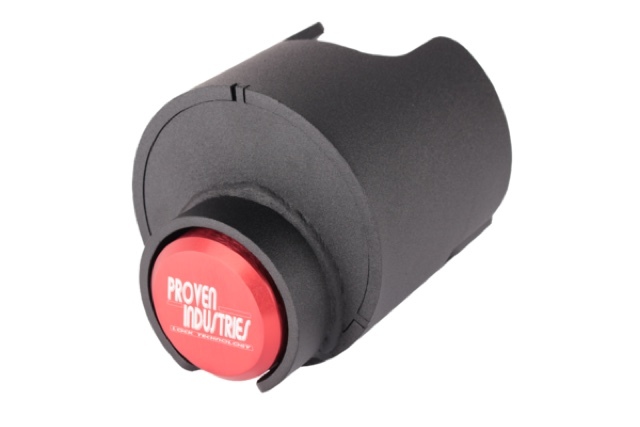 I'm thinking this is healthier for the tires long term rather than sitting on the bare concrete. Tested the awning this afternoon. It works! UPDATE: Rolled it back up. Works fine. It's not as crisp as it was when I first got it. Some of the other arms may have suffered some damage. But it rolls up fine. I am declaring this fixed. We weighed our Airstream today. The total gross weight of AS and TV was 13,560. That's 500 pounds short of my 14,100 pound limit. The rear axle weight came in at 3980. 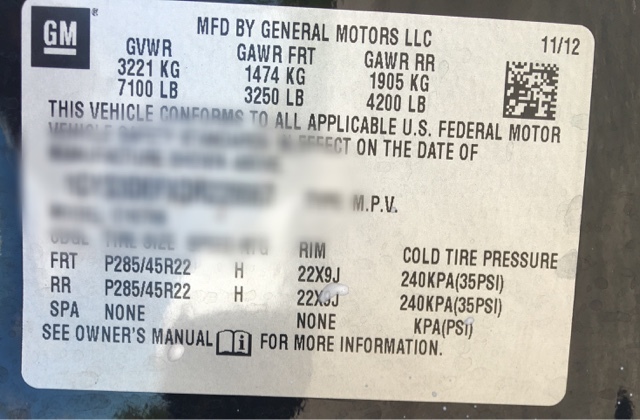 My GAWR (Gross Axle Weight Rating) for my rear axle is 4200. My front axle weight came in at 2920. The GAWR for my from axle is 3250. The AS axle weight came in at 6660. So it looks like I don't need to run out and buy a new truck. Thank God. The rear AC leaked at 2 am, about 5 hours of continuous operation. The front AC worked all night (8 hours +) with no leaks. Time for the AC tech to come out again and drill some more holes. The situation has definitely improved, but I'm a couple of holes short of a final resolution. Tonight I'm testing the ACs again. Set them both on HI fan and will let them run overnight. We shall see if they leak. This Saturday I have scheduled a "weigh in". I am taking my AS to my nearest CAT scale to have it weighed. Since we have been using it for several weeks, I am sure it is loaded with everything we need for camping. The nearest CAT scale is at a Pilot Travel Center 25 miles away. So we will take this opportunity to test our unhooking and hitching procedures as well. It will be like a "dry run" before our first trip in August. CAT Scales have an iPhone app which I downloaded and will use to pay the $10 and change it costs to weigh my trailer and truck. My truck weighs 5527 (give or take a couple of pounds) according to the 2013 Escalade brochure. My wife will be with me, I weigh a bit, but I took the back seats out, so I am going to go with 5800 pounds as my tow vehicle weight. Payload is 1600, and towing capacity is 8300. So, 8300 + 5800 = 14,100. So if I come in at or under 14,100, I will be feeling pretty good. There are a couple other weights (like payload, tongue weight, axle weights, etc.) I need to look at, but this is the big one. The GVWR (Gross Vehicle Weight Rating) of my Airstream is 8800. 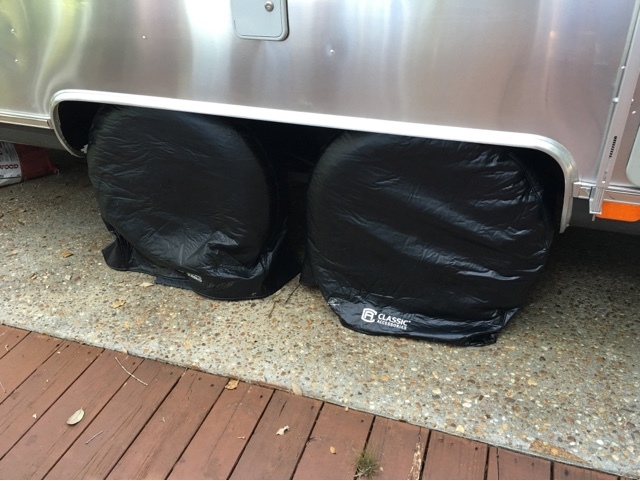 This means the Airstream should not weigh more than 8800 pounds when fully loaded. 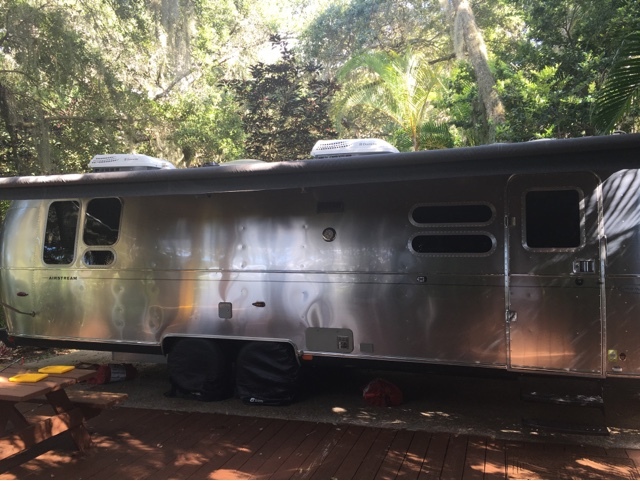 The base weight of the Airstream is 6400 pounds without water or cargo per the Airstream brochure. 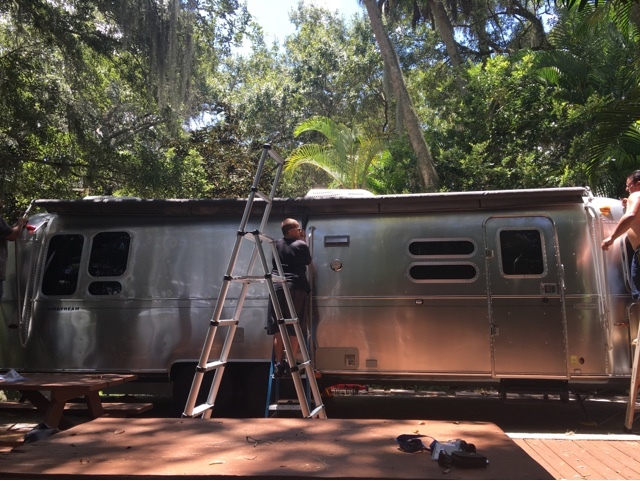 That means the Airstream has a 2400 cargo/water carrying capacity. But since my tow vehicle is rated for 8300 pounds, I am planning not to exceed that. I can carry 1900 pounds of cargo/water. I may be close to that. My first weight exercise will be to weigh my entire setup (tow vehicle and trailer) and aim to come in at or below 14,100 pounds for both. There are subsequent weight exercises I need to do, but this will be the first big one. So the kind folks from Stewarts Mobile Village came by today and reinstalled my awning. It was like putting together a jigsaw puzzle, with one piece being 21 feet long and weighing 100 lbs. So, the good news - the awning is fixed. The not so good news - apparently at some point during this ordeal I tore two little holes in the awning fabric, and the tube that rolls the awning is bent slightly, making the rollup procedure... interesting. In order to fix it 100%, I need a new awning and new roller tube. For what we plan on using this awning in the future, it is PERFECT. So the problem is not 100% fixed. Last night the rear AC leaked. It was just a little, but I'm baffled. The only difference was I put the fan on low instead of high. Next week I'll try it on high again to see if it leaks. The front AC looks good. I can't imagine where that water is coming from. With holes drilled in the drain pan, that shouldn't be happening. Well, turning off iCloud Photo Library seems to have done the trick. We had virtually no usage last night. We have 3.5GB left for the next two weeks. It should be enough. From then on out 12GB a month is overkill as long as iCloud is kept in check. Well, I had the tech back out today, and after much consideration we decided on a much simpler but drastic course of action. He drilled holes on the outside of the drain pans. 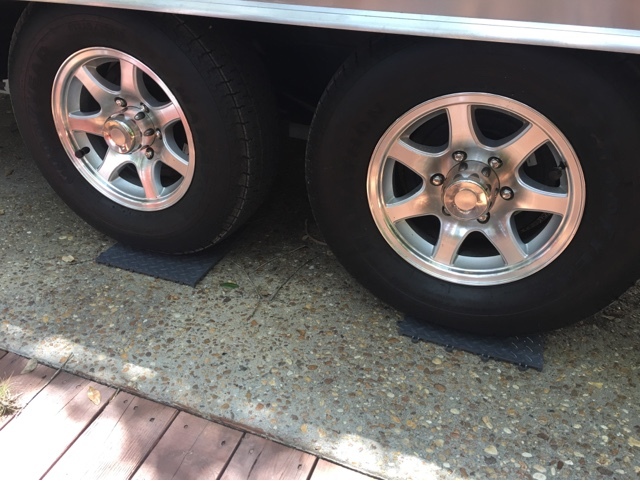 The net effect is that the drain pans drain, but instead of through the tubes down to the wheel well, they now drain onto the roof of the Aitstream, down to the rain gutter and down the side. I'm sure this will cause some issue down the line. But for now I have my fingers crossed that this "solution" will allow me to run my ACs constantly in this 90% humidity without seeing a drip inside the trailer. That's the name of the part that broke off the shower stall door last weekend. The outstanding folks at the Air Forums shared with me a link of where I could order a new one. From the folks that bring you Alumapalooza in Ohio and Alumafandango in California comes none other than Alumaflamingo in Daytona Beach, FL! It Imagine my surprise when I saw my Jetpack consumed 2GB overnight! It turns out iOS devices are very data hungry, especially when connected to wifi. When connected to cellular, there are all manner of safeguard to protect you from excessive data usage. I guess someone forgot to tell Apple about cellular hotspots. First, there's iCloud backup. It backs up your phone overnight when connected to power and wifi. Then there's iCloud Photo Library. It transfers all the pictures and videos you take to "the cloud". Then there's automatic app updates. That 1GB game I have that needed an update? Downloads overnight when connected to wifi. Because, you know, wifi is unlimited. Unless you are using a cellular hotspot. So now we have to remember to turn off about four things on both our iPhones and iPads every weekend so as to not deplete our already healthy 12GB X-large data plan. 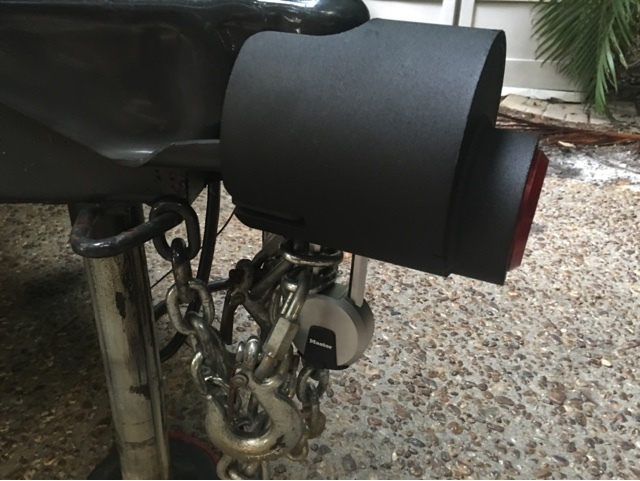 I purchased a couple of cheap security related items when I bought my Airstream. I'm not too concerned about where I store it, but I'd like to make sure it's secure. I saw an online video about how cheap hitch coupler locks can be disabled in seconds, and I decided that wasn't going to be me. 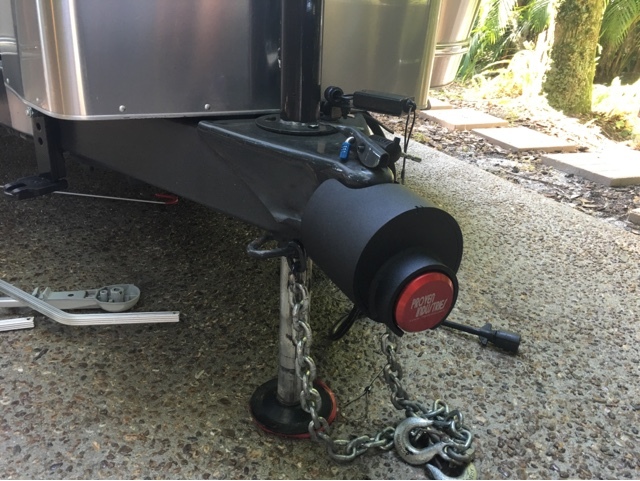 So I got a Proven Industries hitch coupler lock. 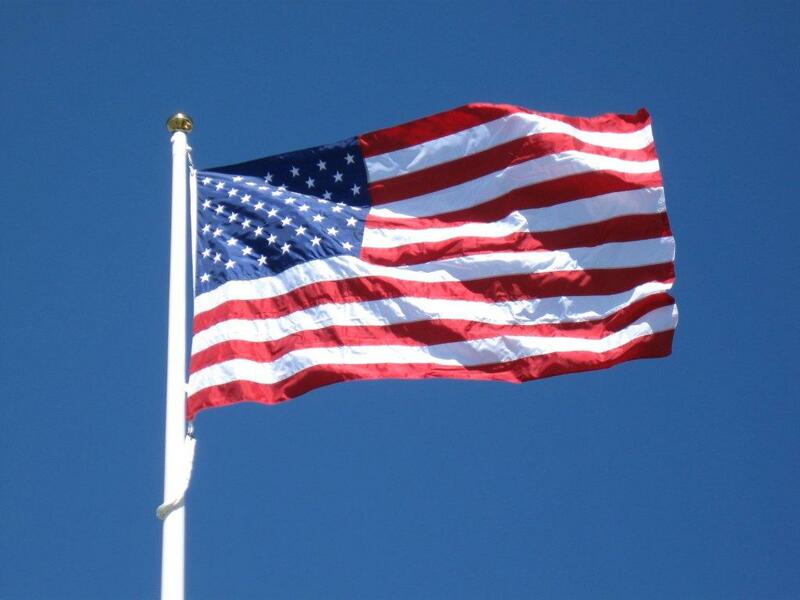 A happy Independence Day to all of you, and a special thanks to the awesome men and women in uniform who sacrifice so we can enjoy our freedom. So I used the trucker antenna I had purchased for the weBoost on the Jetpack. It was good for one bar of signal improvement. Three bars instead of two. I'll take it. 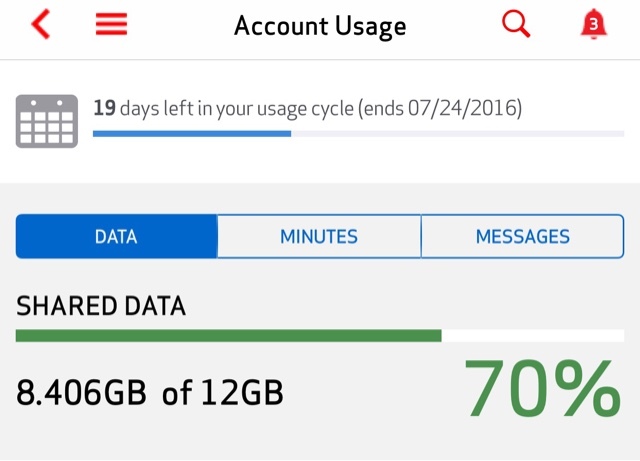 We also upgraded to an extra large 12GB plan, because our iOS devices are data hungry. Our internet connectivity issues are resolved.